The AmHunCham NY recommends to the members of the AmHunCham NY: All week, SBA has live events happening across the country. Social media is a proven channel for helping small businesses find and convert prospects – but it takes time and effort. Small businesses need to find ways to connect, engage and drive actions. 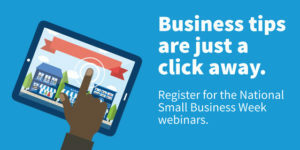 If you’re looking for ideas to kick start or continue building your business using social media, tune into SBA’s live panel discussion with experts from SCORE, Constant Contact, Facebook, Microsoft and YP as they share tips and best practices. Watch the event live streamed at www.sba.gov/nsbw and join the conversation on Twitter using the hashtag #SmallBusinessWeek.